Carmakers needs to raise the power bar for DC fast charging to enable their upcoming long-range electric cars to charge in half hour or so (at least to 80% battery capacity). Audi is one of the first among mainstream manufacturers to announce a long-range BEV, so now it must lead the way (and exceed 100 kW charging, like Tesla already did). Audi has already announced a new alliance with BMW, Daimler, Opel, Porsche and Volkswagen – CharIN e.V. initiative. The new Audi Q6 e-tron with a 95 kWh battery would need about an hour to replenish the bulk of battery in one hour at today’s high end CCS charging abilities (~100 kW), but at the unveiling of the EV, a 150 kW capability was announced. Additionally, the 150 kW must be transferred by the Combo connector (Combo type 2 in Europe and Combo type 1 in North America), so as to not introduce a new charging standard. The charger must be backward capable, meaning that it has to efficiently charge at 40-50 kW for short-range EVs that do not accept high power. Another question is whether Nissan and other companies will increase the available power output of CHAdeMO to 150 kW to match Combo? “Quick and easy charging on the road is a key prerequisite for a breakthrough in electric mobility. That is also why Audi is actively involved in the Charging Interface Initiative e.V. (CharIN). This promotes technical standards in the field of Combined Charging Systems (CCS). The next step is charging with 150 kW of power. The Combined Charging System (CCS) makes it possible to charge electric cars with alternating current (AC) or direct current (DC) via a standardized charging interface known as the Combo plug. The corresponding technology is already on board the Audi R8 e-tron – an electrically powered high-performance sports car – and in the Audi e-tron quattro concept car. In just 30 minutes, the battery of the Audi e-tron quattro concept can be charged with enough electricity for a range of more than 400 km (248.5 mi). When the battery is fully charged, it has a range of over 500 km (310.7 mi). At the ELIV Congress in Baden-Baden, Audi is presenting the first results together with its CharIN partners: equipment and automobiles that are suitable for charging with up to 150 kW. The founding members of CharIN include Audi, BMW, Daimler, Opel, Porsche and Volkswagen, TÜV SÜD and two manufacturers of industrial plugs: Mennekes and PhoenixContact. 88 Comments on "Audi, BMW, Daimler, Porsche, Volkswagen & Others All Part Of 150 kW CharIN CCS Fast Charge Initiative"
I think 150 kW is basically equal to superchargers and it would totally kill off the ICE-car forever, at least when it comes to newer premium cars. To me, this is all bluster until these German Auto co. start really putting their money where there mouth is. You can easily tell someone isn’t in a rush to build EVs b/c every quarter a company has to give guidance on future HUGE CapEx and R&D expenses such as new robots/new plant/new workers/future training and additional Infrastructure. Has Merc/BMW/Audi/Porsche done so? No, and I’ll tell you why. All of these CEO’s have maybe a decade in their tenure and don’t want the responsibility of spending billions and not be able to show quarterly growth. They work for the next quarter and next year’s earnings. They cannot risk their legacy on a questionable technology as EV cars. Someone got some sense into how car companies are treating the EV market. It’s not just about building EVs, but also how much they are investing in its related expenditures. This whole line of comments ignores the mandates that auto manufacturers are under to reduce air pollution and increase fuel economy. Sure the auto manufacturers have make a profit but they all have make a profit while meeting government mandates. Here’s a bottom line for you, if the auto manufacturers don’t meet government mandates they will be subject to heavy financial penalties or, as is the case in compliance states, won’t even be allowed to sell cars. Ever wonder who Tesla and Nissan sell their ZEV credits to? Walmart? Mom & Pop stores around the corners? Much cheaper, easier, and quicker to buy than investing on all those capital expenditure, jsuk. Depends on pricing for the charging partly. The way things are going at public fast chargers electric miles cost far more than gas miles. If I have a trip requiring public charging i just take my prius. Far cheaper. Woah! NOW we are talking. Are they going to install lots of chargers in the USA? Are the US auto makers gonna get in on this?!?! Exactly! “We” are still talking while “they” are doing, have been for the past three years. seems like the article is just talking about equipment capabilities and not necessarily about building out a charging network. Ford was pushing for 150 kW CCS chargers a long time ago and everybody thought they were crazy. Now that we have a picture of a car that supposedly can charge at 150 kW, 150 kW doesn’t sound so crazy anymore. Well that is pretty weird considering that Ford doesn’t even have a single product with a DC-fast-charge port. Neither does Audi. Ford was showing a Focus prototype with DCFC last year. Opel is part of GM, so, yeah one US automaker is in there. Ford is also part of this initiative. “Wolfgang Selle is responsible for E-Mobility, EV-Infrastructure & Standardisation within Ford of Europe (FoE). He joined FoE in 1988 and held a number of positions within Manufacturing and Product Development. In 1988 he took over the strategic planning for large cars within Powertrain Planning. Since 2009 he has been in charge of different functions within Electric Vehicle and EV-Infrastructure. He represents FoE in public bodies like VDA and NPE. IMO, they’re wasting time and money when it’s obvious the winning charging standard will be the Tesla Supercharging network. Just compare plug sizes and try to imagine which plug a dainty woman would prefer to handle. Agreed, but good luck convincing zee Germans that the US did something better than them. …and then convince the countries where the Tesla connector doesn’t meet code. Not at 90 kW, and certainly not at 150 kW. Notice Nelson posted “IMO”, not “IMHO”, and certainly not “IMLEC” (licensed electrician consultation). Tesla uses almost the same Mennekes Type 2 connector in Europe as CCS. Their US plug is dead end, it can’t handle 3-phase AC charging because of too few wires. 3-phase AC is mandatory in Europe. Tesla will either adopt to everybody else, or will go Betamax way. They may go with robot plugging for DC charging if they think such gimmic will wins customers – no need to bother about plug size. Personal garage charging most likely will be inductive anyway. What’s the upper limit for charging kw’s on CCS?? This says up to 600V and 400 amps (240 kw). 150 is nice but we need higher numbers than that. Currently the SAE J1772 DC Level 2 standard is rated for 100 kW. The standard will have to be revised to 150+ kW to have higher powered CCS chargers. …which is why the 150 kW goes through the two additional pins, not the J1772 interface. The SAE J1772 DC Level 2 has seven pins including the two for high current. The five pin SAE J1772 AC Level 2 plug is only rated for 24 kW. The seven pin SAE J1772 DC Level 2 plug is rated for 100 kW. Why am even bothering with this argument again? Look it up! We are talking level 3 not level 2. I’ve been in this argument many, many times before. The 220v chargers common at charging stations are based on the SAE J1772 AC Level 2 standard. 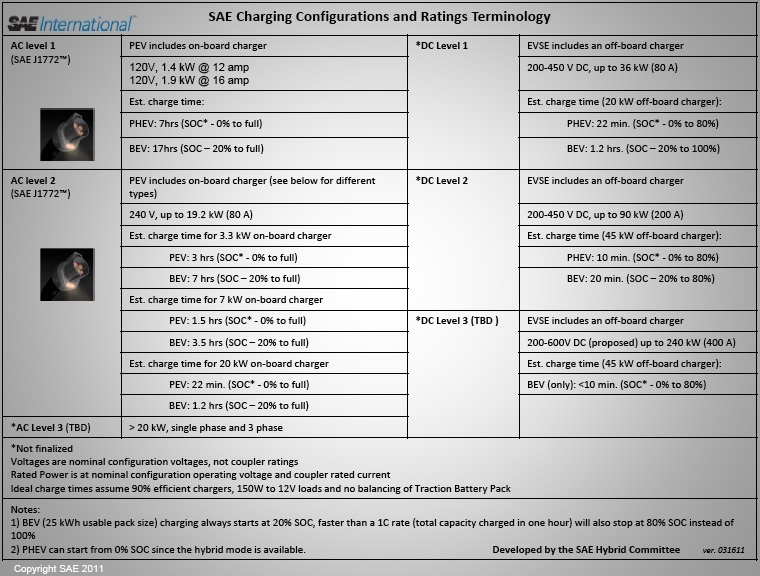 The 440v Combined Charging System chargers that have been adopted by European and American auto manufacturers are based on the SAE J1772 DC Level 2 standard. There technically is no such thing as a Level 3 charger. So this 150 kw charging system that is referenced in the article is AC? I’m done. Research SAE J1772. You’re right I needed the education. Both AC and DC have different LEVELS. AC has level 1 and level 2. DC has level 1, level 2 and level 3. Level 2 DC goes up to 90 kw (wikipedia) DC level 3 (proposed per wiki) will be good to 240 kw. But has not been implemented yet! Texas FFE, LOL! I had the same experience when I had to explain basic Physics. I learned to give up much sooner, although the discussion does give me points to cover when writing my blog. For the curious, this is a nice explanation, especially if you’re still calling DCFC as level 3. I give pass to L2 as L2AC implied as I stick to DCFC as L2 DC fast charging. Came from this blog. He’s got some good stuff. He is referring to official SAE terminology, not the colloquial usage where level 2 = AC and level 3 = DC. The SAE connector/standard necessary for 600V and 400A “DC level 3” is non-existent at the moment. The existing SAE CCS / J1772 DC connector and standard only supports “DC level 2” (450V and 200A). The European CCS standard supports higher voltage (850V and 200A for 170kW), which is likely what this article is referring to. OK thx for the link. I made a chart. Technically CCS is actually currently at 90 kW. See Wikipedia article. And currently CHAdeMO is at 62.5 kW. Going beyond 150KW is not easy. The wires have to get really thick. The batteries have to be able to handle such a torrent. And the utilities have to be willing to put up with such sudden on-set big load. Yeah I’m rather skeptical about all of this. There aren’t many types of EV’s available in the first place, although there are 1 or 2 SMALL suv’s starting to pop up, but not many workhorse pickup trucks, and only by one manufacturer here and another there. Unless there’s plenty interim batteries at the charging site, (increasing the expense of the station greatly), then they’re going to get killed with demand /and / or ‘demand contracted for’ charges. I haven’t heard a satisfactory explanation of who is going to pay for all this happiness, with the possible exception of “our own” Tom M.
You’d think if manufacturers were serious, they’d at least allow cars to charge at the officially sanctioned level 1 rate of 16 amps, but supposedly only the Tesla Roadster (not quite : its 15 amps), and the I3 can handle this rate, (which since the car has to charge at 16 amps level 2 it doesn’t cost anything at all to implement), but then you go to the bmw dealer and the only thing they give you is a 12 amp charger brick. Problems problems problems. Luckily all fictive. Hooked up to the medium voltage grid, a 150 kW load barely registers. Stop the “the grid can’t handle it” scaremongering. Ignore the fossil fueled FUD. Sorry, its you who is not familiar with the real world. Even Tom M. complains about the electric bill on his own subsidized charger 1/6 th the size. The joke here is companies (including FORD, who doesn’t even offer a fast charging capable vehicle) insisting on 150 kw, when they go, what? 5-10 miles in a Mercedes? How about putting something bigger than penlight batteries in their products? That would be a start. So yeah, I still see the whole thing as somewhat of a joke. Won’t be anything near me – the only reason my area got a Tesla Supercharger is that many “S” owners in the area politic’d for it. It was supposed to go Canada’s Niagara Peninsula. Read all the comments in this thread…you can see why Tesla decided to make their own single plug and SuperCharging. Easy to explain to customers. 150 KW seems like the thing to build today. 300 kw maybe what we see in 5-10 years. Make it easy for tesla to adapt. chademo was too slow even thoough its everywhere. They need to get it upgraded to at least 100 kw for gen II leaf. If Porsche indeed develops and uses a nominal 800V battery, as they have announced, charging at 150 kW should be easily achievable. That said, 800V really pushes them into another category when it comes to onboard components. That’s about double Tesla’s battery voltage. At the same charging current that means we would have around 240 kw. Bring it on. At 240 Kw we are getting fillup times competitive with gas. I would hope this is not simply a voltage increase but is an current increase. CCS as a standard does support 850V and 200A (170kW). However, most chargers out there max out at 500V (esp. for dual standard since CHAdeMO maxes out at 500V). If the 150kW spec relies on a 800V battery, there would be many CCS chargers that such a battery can’t be charged at. Exactly! Going up in voltage is good for reducing current, but it does introduce an issue with backwards compatibility. IMO they made a mistake of starting with too low max voltage. High enough voltage should have been carved to stone from the beginning of CCS, and only current should be increased. – Old cars will be compatible with new higher voltage chargers. Output voltage of a DC charger is variable, and it can drop down to the level that is suitable for the car. – New cars with higher voltage battery may not be compatible with all old chargers. The charger may not be able to reach voltage level that the battery requires to charge. Luckily there aren’t too many CCS chargers out there yet, so it’s not too late to step up the voltage. Once you go above 600 Volts, you are in a whole new realm of safety regulations that would make charging (and servicing) fabulously cost prohibitive. You will simply not see system voltages above 600V. Ignore Porsche’s suggested 800V pack, it’s just a concept and they’ll bring it down below 600V if they even go to production. 800 VDC is not high voltage in international standards. If Porsche is planning a car and charging infrastructure not to be sold in America, there is no problem. Actually 800 V is still too low, we need to double it a second time to 1600 V to really allow fast charging similar to ice refill time. We also need to accelerate transition to level 4 at 500 KW or 1000 KW (Megacharger). Maniac, you seem to be the only one wanting this. Very nice of you to pay for the whole shebang. Just reading the names on this press piece, I have a feeling it might be a German only network. At least in its initial launch. OK, GM . . . now is your turn to step up to the plate. If you expect to sell the Bolt in large numbers, you need to support this project and push it in the USA. NOW. Eeeeegad!!! If GM actually pushed an EV project. GM dealers will be jumping of tall buildings in mass. Most of them simply loath EV’s. GM is involved since Opel is involved. Unfortunately, it implies that this is a Euro-Centric Alliance, and won’t apply to the US CCS Standard. There is nothing self-evident from the article that supports your assertion, I’m still waiting for you to provide evidence of your argument. CCS is an international standard, so please show me the data that supports your assertion. Unless there is data to explicitly state this is EU only then given the fact we are dealing with an international standard I believe it’s safer to assume the work would apply to both NA and EU. The fact that Opel supports this effort but not parent GM as a whole neither does Ford,Fiat Chrysler, Renault,Volvo, Jaguar Land Rover,PSA Peugot Citroen. CCS is still an international standard, anything developed for it in Germany is still applicable elsewhere. The development work is still just as applicable outside of Germany. I should also note I don’t have a problem with the Euro-Centric portion of your comment, the members are all clearly European, it’s the applicability outside of the EU that I take issue with. Any development work they do in this area will be easily ported to a US implementation. Not exactly, CCS uses 2 different plugs in North America and Europe. What planet do you guys live on? There are CCS chargers everywhere the SparkEV is sold. Uh . . . chargers at dealerships are not that useful. We need chargers located between cities. Tesla is the only one that has addressed this issue properly. I’m not talking about chargers at dealerships. I’m talking about CCS chargers at service provider stations like evGO. But you are right, there aren’t nearly enough CCS stations away from the big cities. I am glad that at least nrg evgo was forced to have them by the government as part of the price fixing penalties they got busted for… without it there would be basically none up here in northern california. EVgo started (2011) in Dallas and Houston before that California lawsuit was even settled. That said, I don’t think EVgo has done very well to this point. The division was recently sold off from NRG too (for dragging down profits), so I am not sure what the future looks like. As far as I know, there is no CCS charger at any Chevy dealers (idiots!). There are several BMW and Kia dealers with CCS. Thanks to eVgo DCFC, I haven’t driven my gas car in 8 months, even for 300 mile trips. Here in Quebec . Canada the CCS are popping up a new one every week along CHA deMo on the same charger we have both of them . You get there with a Leaf or a Spark ev you can charge it fast. For the next 2 years that will change a lot like that change a lot for the last 2 years. So much argument for so little. Good one. It’s already been more than a month, since the official “CharIN e.V.” played with the Shift key. That means the press release, and story, should be good for at least another several. None of the brands have any independent engineering decision-making at this level of tech. In fact, I’d bet that they were all represented by the same single engineer (or small group of engineers) in the standards committee. They could have finalized the job since they forgot to mention Seat, Skoda, Bentley, Bugatti, and Lamborghini. It’s great that in Europe they are shooting for 150 kW starting in about 2 years or so. What CharIN is demonstrating now is that it is possible to do it. The CCS standard will need to be updated by SAE at some point. Then car manufacturers and fast charger manufacturers will all be on the same page going forward. For the US from what I have gathered, my opinion is that we may only have up to 100 kW fast chargers for the next gen EV’s like Chevy Bolt and Leaf 2. I’m not sure, but IMHO to hit 150 kW adoption in the US may only happen when the 3rd generation of affordable mass produced EV’s come around maybe 2023-2024. Do you know how much voltage and current that 120kW will be at? Saying just 120kW doesn’t tell much. There is a significant difference between for example 400V x 300A = 120kW and 600V x 200A = 120kW. It is great to see more 300+ mph charging options coming to market! This shows that Tesla might be better off in the future also providing a CCS adapter. The last I heard on that front was in 2013 when they said that there are no CCS chargers. This has changed a lot, especially in Europe where we now have over 1500 chargers. They would better off doing it without adapter hassle, especially in Europe. Though for now most places with CCS have Chademo too. The German are back to their old habits… back in 2010 when they realized they didn;t have any EV to put up for sale when Nissan launched the LEAF, they started the CCS nonsense against Chademo. It’s like they want to confuse the market intentionally to slow down EV uptake in general and keep selling ICE cars which is their bred and butter. They should stop talking and start doing! Every gallon of gas you buy supports terrorism. Buy a plug-in car. Put that on a bumper sticker. What’s a car with an ICE? Seeing as the Tesla supercharger currently has a continuous rating of around 62.5 kw (I’m quite surprised as to how LOW the long time rating is – and this is split between 2 cars), I’m sure Tesla is reluctant to send the juice to a “Foreign” car that might draw 120 kw for much too long and burn out the charger bay.